Over the past five years, a series of discoveries by the multi-spacecraft Cluster mission have significantly enhanced our knowledge of how, where and under which conditions killer electrons are created in the Earth's magnetospheric environment. During intense magnetic storms (driven by enhanced solar activity) highly energetic electrons (the so-called killer electrons) are often responsible for permanently damaging satellites and pose a serious hazard to astronauts. Early satellite measurements in 1958 revealed the existence of two permanent rings of energetic particles around the Earth. Called the Van Allen radiation belts, they are filled with particles trapped by the Earth's magnetic field. Observations showed that the inner belt contains a fairly stable population of protons and electrons, while the outer belt is mainly composed of electrons and varies considerably. Diagram showing the Van Allen radiation belts. Some of the outer belt electrons can be accelerated to very high energies (several millions of electron volts). Such highly energetic electrons, sometimes called killer electrons, represent a hazard to satellites. Killer electrons can indeed penetrate thick shielding and provoke internal electrical discharge (miniature lightning strike) around sensitive satellite electronics. These discharges can perturb or permanently damage any satellite flying through the belts, affecting: TV and telephone broadcasting, GPS signal and radio navigation. This intense radiation environment is also a threat to astronauts. Killer electrons can increase by a factor of a thousand during a magnetic storm. Intense solar activity can also push the outer belt much closer to the Earth, therefore subjecting lower altitude satellites to a much harsher environment than they were designed for. Due to our increased reliance on space based technologies and communications, the understanding of how, under which conditions and where these killer electrons are created, especially during magnetic storm periods, is of great academic and practical importance. Image 2: Waves observed by the Cluster spacecraft. Data from the Wideband (WBD) plasma wave instrument on one of the four Cluster spacecraft (Samba) is shown for 31 October 2003. The wave electric field Ey transverse to the ambient magnetic field is shown in a, and wave magnetic field By in b. The colour bars on the right give the calibrated wave power spectral density for the wave electric field (a), and relative wave power spectral density (in dB) for the wave magnetic field (b) [courtesy of Dr. Richard Horne]. Until now, the acceleration of radiation belt electrons was explained by a theory called radial diffusion*. Recently, a team of European and American scientists contradicted this long established theory [Horne et al., 2005]. In their Nature letter, Dr Richard Horne (British Antarctic Survey, Cambridge, UK) and co-workers indeed show that very low frequency waves, named chorus, can cause the particle acceleration and intensify the belts. Data acquired in space (Cluster mission satellites - Image 2) and on the ground (wave receivers, Antarctica) during the 2003 Halloween solar storms were used to draw this conclusion. Chorus are natural electromagnetic waves in the audio frequency range. They consist of discrete elements of short duration (< 1s) that sound like the chorus of birds singing at sunrise (select Sound of Plasma Waves from under related links). These waves are among the most intense in the outer magnetosphere. They can accelerate particles via a cyclotron resonance where the wave frequency is Doppler shifted to the cyclotron frequency of the particles. 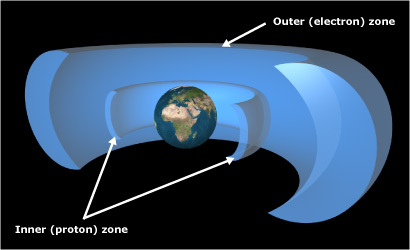 The source region of chorus emissions is centred at the geomagnetic equator. However, the properties of the source region are still a subject of active experimental and theoretical research by the Cluster spacecraft. In particular, determination of the size of the source region is of key importance, to allow effective comparison of theoretical predictions with observations. Image 3: Expanded record of a 5-s-long data segment, starting at 13:13:15 UT, on November 27, 2000, showing a sequence of individual chorus elements observed on both SC1 and SC2. The magnitude scale refers to electric field amplitude with 0 dB corresponding to 1 V/m/√Hz. The SC2 panel is repeated on the right to illustrate the differential Doppler shift. Also shown in the bottom right panel is the location (not shown to scale) of the spacecraft with respect to the two possible source locations (as derived from our analysis) along the field line. The small panel on the bottom left of this diagram shows the entire field to provide perspective. [courtesy of Prof. Umran Inan]. Thanks to the unique multipoint measurements capability of Cluster, the characteristic dimensions of the chorus source region have been estimated for the first time. Typical dimensions have been found to be a few hundred kilometres (60 -200 km) in the direction perpendicular to the Earth’s magnetic field (B0) and a few thousands kilometresI in the direction parallel to B0, [Santolík and Gurnett, 2003; Santolík et al., 2003, 2004a]. These observations are in agreement with a theory developed by Trakhtengerts . However, the dimensions found so far are based on case studies. "Under disturbed magnetospheric conditions, the chorus source regions form long and narrow spaghetti like objects. The question is whether those very low perpendicular scales are a general property of the chorus source mechanism, or just a special case of the analysed observations. A systematic study of a set of similar multipoint observations is under way", concluded Dr. Ondrej Santolík, associate Professor at Charles University, Prague, Czech Republic, and co-authors in [Santolík et al., 2004b]. Dr. Ondrej Santolík is Co-Investigator of the Spatio-Temporal Analysis of Field Fluctuation (STAFF) experiment and the Wide Band Data (WBD) instrument. These results are based on the analysis of measurements by WBD and STAFF on all Cluster spacecraft. A related scientific breakthrough based on Cluster data was published 14 May 2004 in the Journal of Geophysical Research [Inan et al., 2004]. In this paper, Prof. Umran Inan from Stanford University (California, USA) and co-workers present the first experimental evidence that source regions that emit discrete chorus waves are in rapid motion. Before Cluster, only two spacecraft (ISEE 1 and 2 in the 70's-80) gathered a large amount of simultaneous chorus data. However no one-to-one correlation between any of the chorus elements could be found, probably due to the large separation distance between the two satellites. 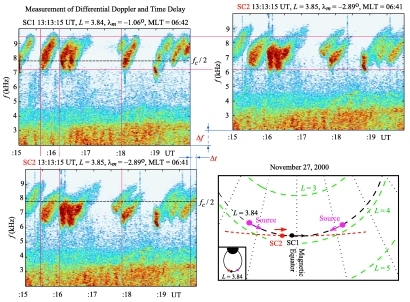 The first simultaneous observations of chorus emissions on multiple satellites were performed by the Cluster spacefleet [Gurnett et al., 2001]. However, these observations were surprising as the same individual elements were observed at different frequencies on different spacecraft (Image 3). 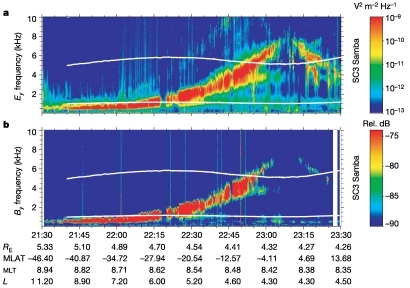 "We provide a natural interpretation of these observations by invoking rapid motion of the compact source region(s), which leads to a differential Doppler shift between the two spacecraft, hence the observed frequency differences," wrote Umran Inan. Professor Inan is Co-Investigator of the Wide Band Data (WBD) experiment. These results are based on the analysis of measurements from the WBD experiment on all four Cluster spacecraft. Philippe Escoubet and Matthew Taylor, SCI-SH division RSSD, ESA, The Netherlands. *Radial diffusion theory can be explained by thinking of the Earth’s magnetic field lines as elastic bands. If the bands are plucked, they wobble. If they wobble at the same rate as the particles drifting around the Earth then the particles can be driven across the magnetic field and accelerated. This process is known as radial diffusion and is driven by solar activity (British Antarctic Survey – BAS -- press release No. 13, 2005).